The starting and charging systems are two of the most important components of your vehicle—they work together to start the engine and maintain power to electrical systems. The process begins with the starting system as it converts electrical energy from the battery to mechanical energy via the starting motor. This motor then transfers the mechanical energy to the engine, effectively starting the car. Once the engine is started, the charging system takes over. It is responsible for generating power for the vehicle’s electrical systems by converting mechanical energy into electrical energy. The charging system is energized by the battery and then driven by the power of the engine. Once all of the electrical systems have been supplied with adequate power, the charging system sends current into the battery to restore its charge. Many components make up the starting and charging systems, and a lot can go wrong. If you’re experiencing any issues starting your car or maintaining power, bring your car to Five Star Auto Care. With our highly trained technicians and state-of-the-art service center, we’ll have you on the road in no time! A vehicle’s battery serves as the backbone of its electrical system by supplying power to both the starter and ignition systems. It accomplishes this by converting chemical energy into electrical energy. Most modern vehicles use a lead-acid battery encased in plastic. Contained within these batteries is an arrangement of positive and negative plates as well as a mixture of sulfuric acid and water. When the electrolyte mixture comes in contact with the lead plates, it creates a chemical reaction that enables the battery to store and release energy. Furthermore, these plates are connected to two terminals that link to the starter and ignition systems, allowing voltage from the battery to flow to them. Batteries don’t always show signs that they are failing, so it’s important to check them periodically. At Five Star Auto Care, we recommend that you check your battery at every oil change (about 3,000 miles or every 3 months). Check to make sure that the battery is securely mounted—vibrations from the car can greatly shorten its lifespan. While inspecting the battery, make sure that it’s securely mounted—vehicle vibrations can greatly shorten its lifespan. In addition, check that the connections are clean, tight, and corrosion free. You can use a mixture of baking soda and water to clean them or use chemically treated felt rings around the posts to prevent corrosion. 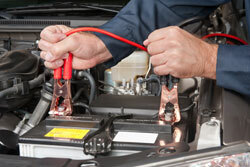 If you need a new battery or want your existing one inspected, come to Five Star Auto Care. Our state of the art service and repair center is located in Auburn, CA. Imagine you start your car and begin to drive. Everything seems normal, but you slowly start to notice that your AC isn’t working; next your radio shuts off; and maybe your headlights begin to dim. You might have a bad battery, but the more likely scenario is that your alternator is failing. An alternator is a mechanical device that generates a current for recharging the battery and for powering certain vehicle electrical loads. When you turn the key in the ignition, the battery current energizes the alternator. Subsequently, mechanical energy is transferred from the engine to the alternator by a ribbed drive belt on a pulley. Within the alternator, a rotating magnet called a rotor turns around a stationary iron core called a stator. Surrounding the rotor and the stator are a series of conductors wound in coils. Together, these alternator components convert the engine’s mechanical energy into electrical energy through electromagnetic induction. The resulting alternating current is sent to the vehicle’s electrical system and to recharge the battery. Without an alternator, your car’s battery would be unable to recharge itself, and electrical components like the radio, AC, headlights, etc…would not be able to function. Prevent a bad alternator from stranding you by letting Five Star Auto Care check is on a regular basis. Our service and repair center is located Auburn, CA. Starting the engine is arguably the most important function of a vehicle’s electrical system. To accomplish this, the starting system converts electrical energy from the battery to mechanical energy through a starting motor. A starter is composed of an electric motor that drives a pinion gear designed to engage with the engine’s flywheel. When the ignition switch is turned, the starter cranks the engine using this mechanical energy. Overtime, the battery’s cables can become corroded or loose, causing slow cranking, arcing at cable connections, and other electrical system problems. To prevent this and to ensure good starter perfomance, Five Star Auto Care recommends checking the battery cables at every oil change. Another starter issue occurs when the pinion gear that meets with the engine’s flywheel becomes worn. When this happens, the engine will not reach the necessary cranking speed and will not start. As an added measure of protection, we recommend that you have your alternator tested prior to any long car trips. To have any components of your starting system checked, come by our service and repair center, located in Auburn, CA.